About three years ago I was one of a small group of people who met in the bowels of the National Museum of Wales in Cardiff to discuss the options for producing an online guide to the freshwater diatoms of Britain and Europe. There were, we reasoned, good guides to most of the rest of the algae found on these islands, and plenty of guides to the diatoms of continental Europe. There was also an active community of people interested in diatoms for a variety of reasons, both professional and recreational. There had also been well-intentioned initiatives in the past, the most recent of which was a CD-ROM that I helped to produce for the Environment Agency a few years ago. I wrote about that sorry saga in “The decline and fall of a CD-ROM”. There are good reasons why it has not been possible to produce a good guide to diatoms in the past, not least of which has been the shifting sands of diatom taxonomy, which creates instability for anyone who is trying to collate information on the present state of play or, for that matter, to put names on the myriad forms of diatoms that one sees when peering down a microscope. A more practical reason, over the last few years, has been the absence of anyone with the time and resources to mastermind a project but that situation was about to change, thanks to the National Museum of Wales, who gave their diatom curator Ingrid Jüttner time to work on the project. They also had experience of developing online taxonomic aids, and a basic “shell” for a website that could be adapted to our needs. The missing link was funding to allow others with practical or academic interests in diatom taxonomy to travel and meet up to support the project. That problem was solved thanks to generous support from the British Phycological Society. 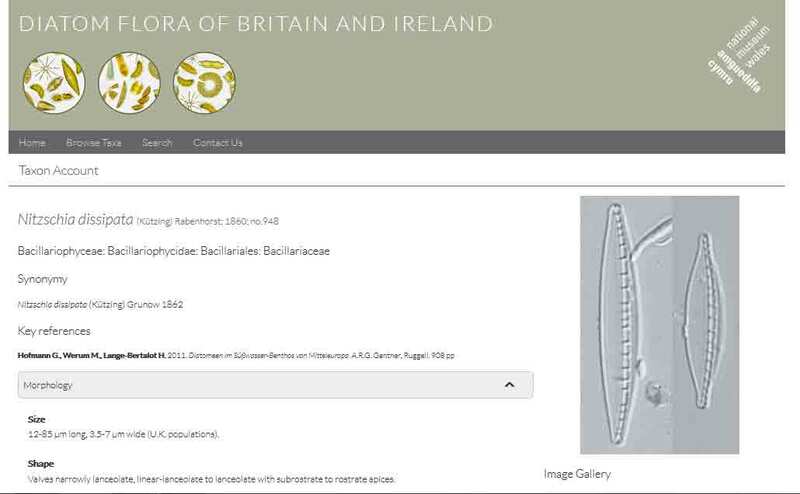 The homepage for the genus Nitzschia in the Diatom Flora of Britain and Ireland. 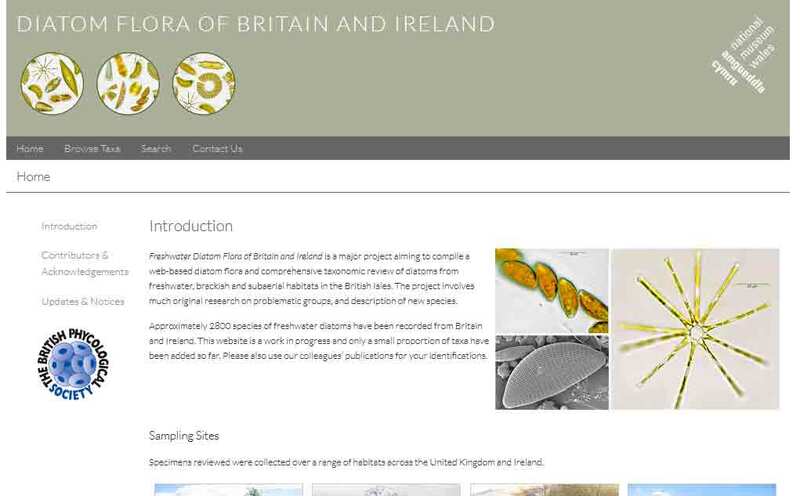 And so, today, the Freshwater Diatom Flora of Britain and Ireland was launched on the National Museum of Wales website and I encourage you all to have a look. Comparing the swish tablet-friendly website to our CD-ROM is a salutary experience. That had to be run from a computer with a CD-ROM drive, which meant that either your microscope had to be close to your desktop or you had a laptop or you were constantly dashing across the laboratory to compare the image on the screen with the specimen under your microscope. There was, at the time, an edict within the Environment Agency that prohibited desktop computers from laboratories, which further complicated the issue. Now you can check specimens on an iPad as easily as consult a paper flora. And that is quite important because, in my experience, there are three levels of biological identification. First, there is a basic pool of species that you can name from memory, then there are rare and difficult specimens that cannot be identified easily and which require you to consult the literature. Finally, there is a group of species that fall between these two categories that you recognise but for which you may need a “nudge” to match them to the right name. For these, an aide mémoire that you can consult easily is invaluable. I always felt that the Lucid software that drove the CD-ROM was a little too clunky to serve this purpose, but a website accessible via a tablet might approach the functionality of my paper-based identification aids. The diatom flora has images and descriptions of most freshwater genera, and of the most commonly encountered species. But there is still a long way to go. The next couple of years will see us start filling in some of the gaps in order to improve coverage, both in the number of species and the amount of information about each. At the moment, the focus is on valve morphology, but there is more that could be written about live diatoms and about their ecology, for a start. But we have made the first steps and, importantly for this modern age, we have burst the old paradigm that regards taxonomic literature as stolid inflexible overviews of the state of the art at a point in time, and emerged blinking into a new era where the medium is flexible enough to accommodate change and evolve as our understanding improves. 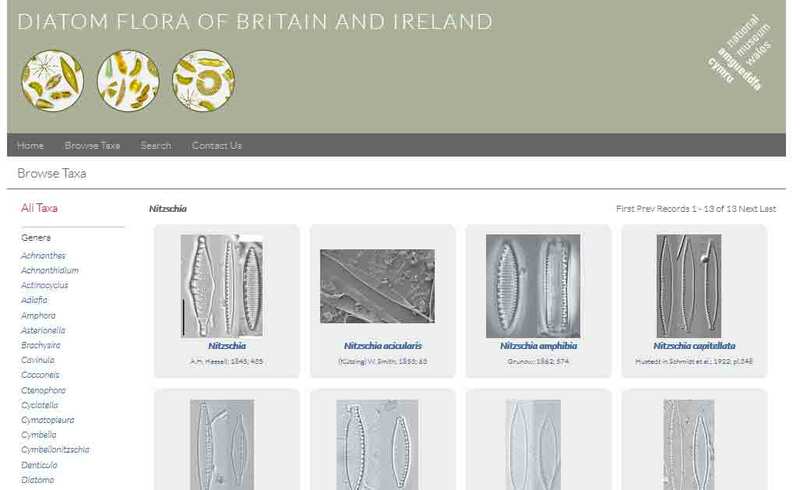 The webpage for Nitzschia dissipata in the Diatom Flora of Britain and Ireland, with the description on the left and images on the right. This entry was posted in Uncategorized and tagged diatoms, identification, National Museum of Wales, website. Bookmark the permalink.